The 53-year-old, who was born into a Jewish family himself, but no longer identifies with the religion, said his main issues arose from the principle that patients needed to be able to consent to surgical procedures. “I follow the basic principles of medical ethics and circumcision is given a free pass to bypass that,” he said. Dr Niall McCrae, a mental health lecturer at King’s College London, claims it should be considered in the same regard as female genital mutilation. Would this be the outcome if the genital mutilation victims were girls? “A medical tribunal is to consider lifting a ban on an NHS psychiatrist who illegally circumcised dozens of boys for religious reasons. Dr Hassan Abdulla was banned from performing surgery for two years in 2014. The condition was imposed after a Medical Practitioners’ Tribunal Service (MPTS) panel found him guilty of misconduct. “Denmark needs to have a clear policy when it comes to circumcision of young boys, and on Tuesday the nine people on the Ethical Committee of the Medical Association can send an important signal to the nation. “It would be a signal that the Danish medical profession wants a ban on circumcision before the child is 18 or older and of legal age to make his choice. “Medical Ethics is simple: It does not cut healthy people. Infants have not made such a choice. “How hard can it be? “On one front, the tireless researcher, consultant Morten Frisch, documenting circumcision’s negative consequences…. “Step by step, Frisch and companions have documented the visible physical and psychological complications, the legal flaws and challenged the obvious ethical lapses. “On the other front, a number of people, with TV host Martin Krasnik as one of the more well known and offensive characters, reject the idea that circumcision is a public matter. “The operation is trivialized and made into a private matter, which is inextricably linked to thousands of years of tradition and belonging. And in the aftermath, you often hear that a ban will lead to emigration and an even more widespread use of quacks. “It is argued even for – with support from WHO – that circumcision can have positive effects in relation to sexually transmitted diseases, but also here is the documentation modest. “The hot porridge, which so diligently walking are around, of course, fear of stepping two religious groups toes. This causes many politicians to tread water, and it has received National Board of Health to tread water after the release of the limp guidance in 2014. “All due respect for the freedom to practice a religion, but Denmark should at least create equality when it comes to circumcision. It is morally thin leg, that we ban the genital mutilation of African girls, but not Muslim and Jewish boys. “While the discussion back of the front takes on a more aggressive tone, we can hope for a more cool consideration of three of the relatively new and younger forces in the key positions in health care. “It could be the Medical Association President, Andreas Rudkjøbing that – hopefully on the basis of an opinion from the Ethics Committee – can put the association’s strong voice behind the demand for a ban. 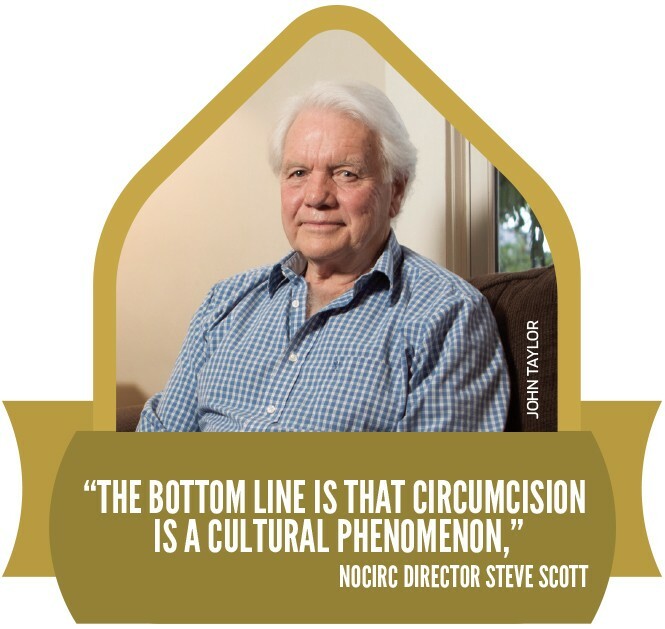 He certainly has the backing of the 3,000 colleagues in DSAM that called circumcision without clinical evidence of mutilation. “It could be the National Board of Health Søren Brostrøm, which – of course on a mandate from parliament – may revise Anne Mette Dons’ shoddy guidance from 2014. The protest, organised by Mike Buchanan, leader of the political party Justice For Men & Boys, started at 1300 sharp and by the time I arrived several were already present, setting up banners and talking with the local police – they had arrived to oversee the demonstration. It was a hot day, certainly perfect weather for a protest, people will be out and about, living their lives and hearing what we have to say. We were collecting outside the Temple Fortune Clinic, this location had been chosen because Dr Martin Harris, a known genital mutilator, worked here. We were hoping to see him. Spenst Hansen knows better than to take his body for granted. Born in the midst of his parents’ divorce, the 24-year-old Salt Laker was, of course, a major sticking point in the split. More surprisingly, so was his circumcision status.